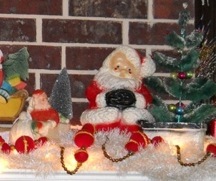 This is a shot of my fireplace mantel this past Christmas. 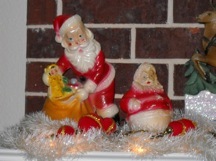 It's rare that I do the same scene two years in a row, but I like these jolly chalkware Santas (and Mrs. Claus) so much I may do it again this year! 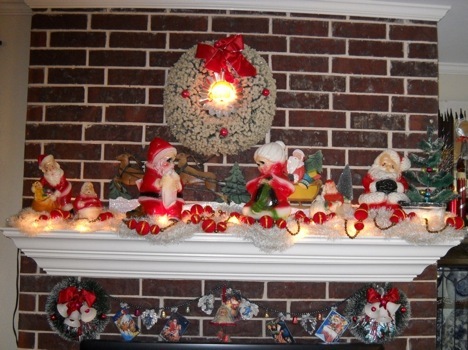 I started with propping a 3-foot pressed paper store decoration of Santa and his reindeer on top of a couple of vegetable cans against the back of the mantel. This old piece is so gorgeous, I didn't want it to get lost visually. Next, I loosely curled two strands of white lights all the way across. Then, moving the lights around to make room, I positioned the chalk pieces where I thought they looked balanced. I covered the lights with two vintage white garlands and topped that with two vintage garlands with flocked balls and gold mercury beads. Finally, I placed a flocked wreath in the center of the chimney and threaded an old lighted Santa tree topper through the middle. If anyone has any ideas on how to make this scene even cuter, please speak up! 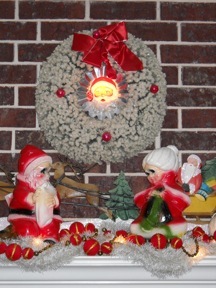 One caveat: There is one non-chalk Santa item in the scene. Can you spot him?